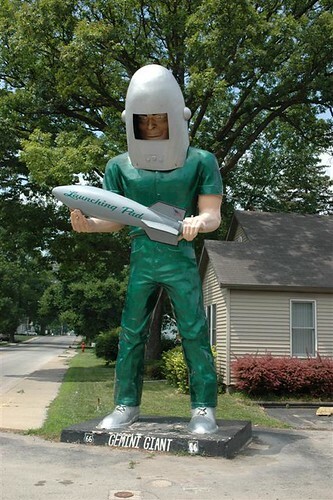 We were all looking forward to lunch at The Launching Pad Drive-In in Wilmington, IL. 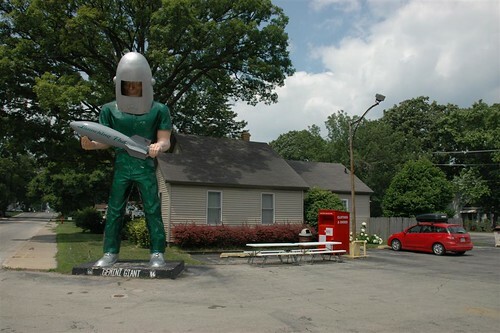 The Drive-In is right on old Route 66 and is easily found if one looks for the Gemini Giant out front. 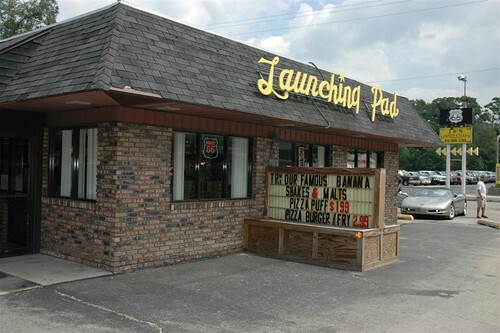 Unfortunately, we don’t recommend looking for the Launching Pad, unless one is looking for it in order to avoid stopping in. There’s nothing in the outside appearance to justify this attitude: it’s a little rundown-looking, but not overtly scary or anything like that. Not really the most pleasant conversation, but again: nothing really scary. Now, at this point in the narrative, I’d like you, the reader, to pause and consider how you might handle this. 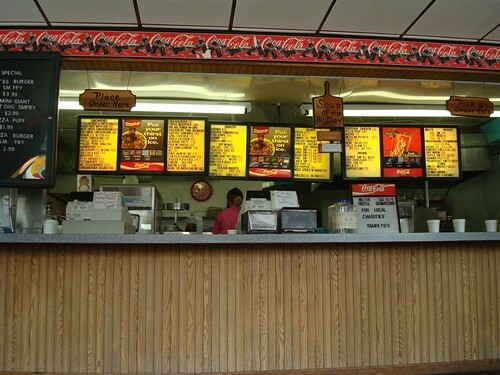 You’re a restaurant in a small town. Someone who is most likely a regular (his kids were wearing softball uniforms and later on he referred to the owner of the place by name) is upset because one of his children has just injured themselves—significantly but not necessarily severely—on the door of your place of business. What do you say? How do you approach the matter? Note: “What’s wrong with it?” Not, “Is he all right?” Not “I’m so sorry.” No, just a question that implied that this man was an idiot. Again, nothing. No one moved to help, no one spoke. One got the feeling that they would have shrugged in disinterest except that it was too much trouble. There was a slight muddle outside, as there were two grandparents there, as well as the boy’s two brothers. While this was happening, the women—either not knowing or not caring that we in the dining room could hear what they were saying—started talking in the most callous way about the incident. She wandered over, looked for a minute, and then came back to report, “There’s nothing wrong with the door. It’s the brush, the frame on the brush is a little bent.” Clearly, to her, the fact that this was technically part of the door was beneath notice. In her mind, this settled the issue. 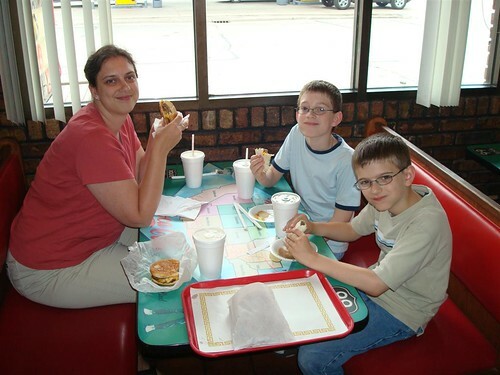 Now, the two older adults of the family group came in, with the two other boys, to place an order—the mom and dad and injured boy already en route to the hospital. The woman said, “You need to get that door fixed.” She wasn’t shouting or rude, just matter-of-fact. At this point, we had finished and gladly left the restaurant. Now, clearly, there was some grey area here. Those of us with small boys know that frequently, they aren’t as careful as they ought to be. They’re a bit accident-prone. However, I was appalled at the callous disregard of the women behind the counter. They did not care that someone had been injured. They didn’t fill out any kind of incident report. They didn’t check to see whether they could help. They could barely be stirred to STAND UP and LOOK at the door. And on top of this, they proceeded to talk about this to other patrons, who happened to be related to the injured party. You know, the food was adequate. It was neat to be on Route 66 at a somewhat-historical restaurant. But I will never go into that restaurant again unless I have no choice or I see banners proclaiming “New Management and New Staff.” To be treated with disinterest as a tourist is (sadly) somewhat-expected. But blatant disregard for injury is another matter entirely, and I am sad that we had already given them our money and business.